I wanted to make the mirror by myself and it was my first mirror (and I did not intent to start first with a smaller one to get used to it). This seemed to me the most limiting factor ! 14 inch f/5 seemed a good compromise. To me. Others thought it to be not as suited as a first time mirror. The first version 2003 of my 14 inch was not explicitly intended to be extremely light weighted. It was more important to pack it into a compact box. I therefore decided that the secondary cage should fit into the mirror box to be protected during transport. 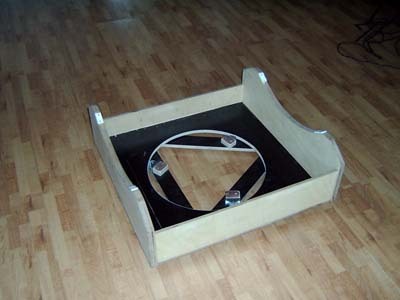 The mirror box was therefore designed to be wider and higher than required by the mirror and to have a top cover. 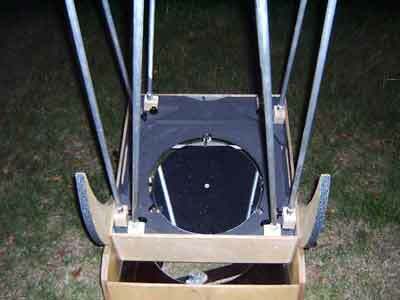 This of course increases the overall weight of the telescope, yet it is still light enough to be carried completely by one person. How did I start? The first parts were the secondary holder and spider. Then I constructed the secondary cage and in parallel the mirror floating cell. After that I built the mirror box and the pole seats. Then the mirror blank arrived and I ground, polished, and parabolized the optics. 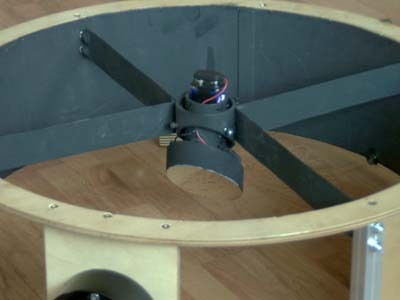 After having finished the mirror and fixed the focal length, I could calculate the center of mass and design the rocker box and the ground board. 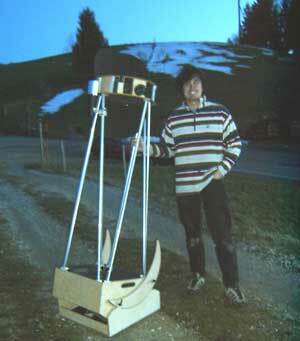 For designing the telescope, I used the program newt of Dale A. Keller. 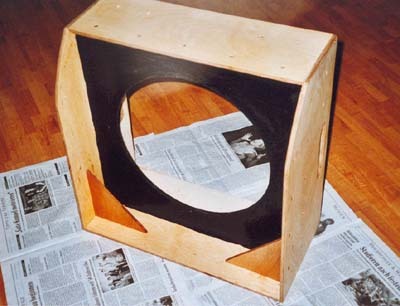 All wooden parts were oiled or blackened by matte black paint. Oiling already gave a quite resistant surface on my travel Dob and looks nice. The 15mm poles have been replaced by 20mm poles to increase stiffness. The upper cage has been completely redesigned using aluminum instead of wooden rings (increasing stiffness considerably) and a wire spider. The surface treatment inside the mirror box (flat black paint) proofed to be not sufficient to prevent mold. These parts have therefore been treated with a conventional water-soluble wood lacquer. For lunar and planetary sessions, a full shroud is now used to prevent body heat from entering the light path. 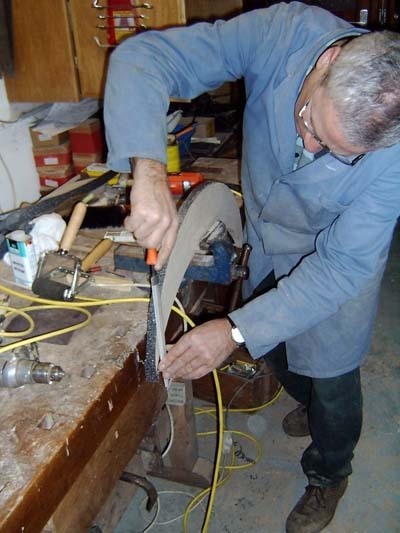 Browsing through all the telescope designs that can be found on the internet, I liked by far the most that of Stathis Kafalis' Kyklopas (as so many other things on his web pages ). I tried to further simplify constructions, as I am not an expert on working with metal. 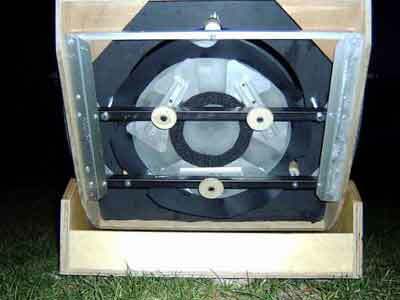 I arrived at a design consisting of two short concentric aluminum tubes, where the inner tube, that carries the secondary mirror, can be aligned. Is there any simpler design? With this design, it is possible to have the secondary (attached with silicone glue) at almost the same level as the spider. 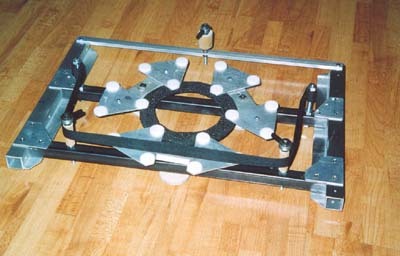 The secondary cage can thus be very low without the secondary or the spider protruding out of the cage. The spider consists of aluminum sheets of about 0.5 mm. No, I am not paranoid about obstruction, I just had this at home and could cut it simply with big scissors. With a normal spider, this would probably be not stable enough. 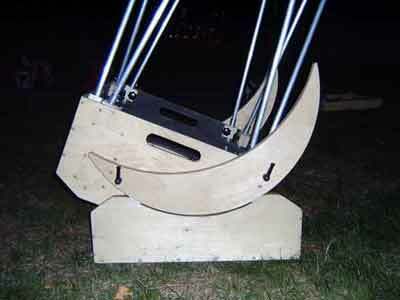 In combination with the excentric spider, however, it works fine, without to much tension. 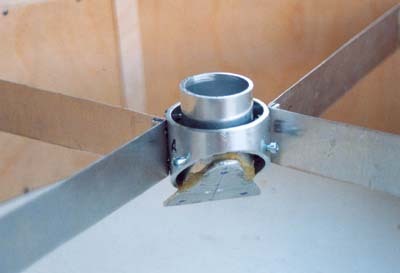 The spider is connected to the cage by slotted machine screws glued to the spider vanes with a special epoxy (UHU Plus Acrylat) that works well with smooth metal surfaces. After several nights with fogged secondary in my travel Dob, I knew that the "Big One" should have an anti-dew system, such that the poor little thing (66 mm Pyrex) should be cozy and warm even in winter. The heating consists of three resistors with together 0.5 Watt, supplied by two AA cells that fit, if needed, into the secondary holder tube. 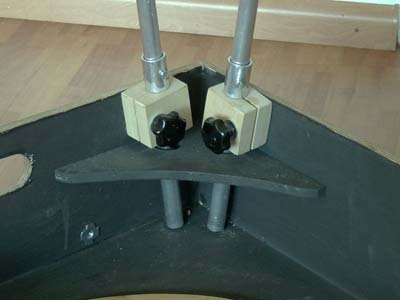 There is an additional safety line that prevents the secondary mirror from falling out of its holder during adjustment. 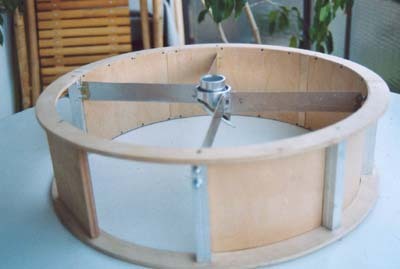 The "hat" consists of two rings of 6mm birch plywood with an inner diameter of 42 cm. 6 mm is really borderline, 9 mm would be more on the safe side (and bent aluminum rings, as I used it later for my 22-Inch Dob, would be the best... ). But even with the 6 mm plywood, my heart was bleeding when I saw this waste, just for two tiny rings . 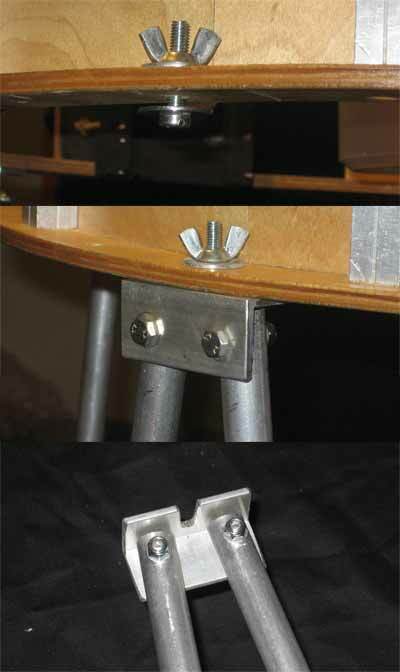 The rings are connected by square aluminum tubes, into which I had glued pieces of wood to hold the screws. 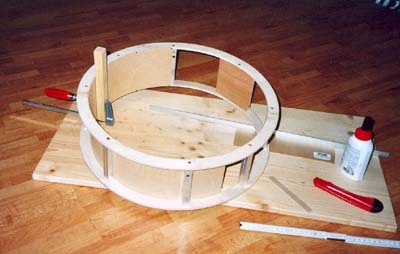 The hat was then covered by thin 1.2 mm plywood (glued and nailed), which considerably increased the stiffness of the whole cage. As a focuser I decided to use the Helifok of Gerd Neumann, which is similar to the KineOptics focuser, which I like very much. 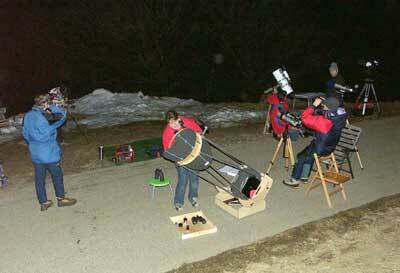 I consider the helical Crayfords to be the best focusers for visual use on such a Dobsonian. 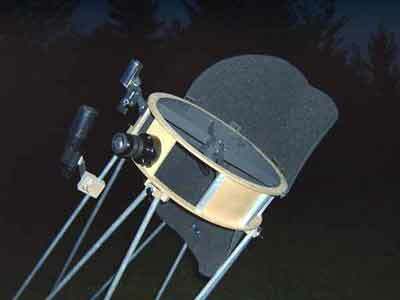 To prevent stray light from entering the eyepiece, I have two shields consisting of 10 mm black foam camping mattresses. The poles are 15 mm OD aluminum tubes with 1 mm walls. I bought them for 15 Euro at a local aluminum supplier. The lower pole seats are made of slotted oak blocks. 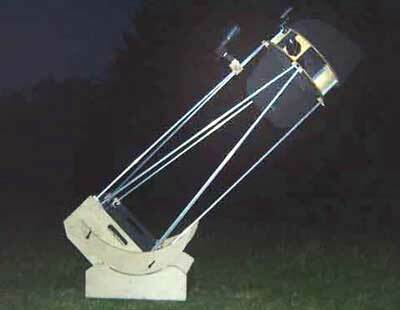 The poles are longer than necessary and have adjustable sleeves, that allow to change the position of the focal plane in the finished telescope. The floating cell of the primary is a classical 18 point cell after Kriege and Berry. The cell is made of aluminum profiles and steel rungs. The geometry of the cell was calculated using David Lewis' Plop. In the meantime, I exchanged the classical sling support by a different type of lateral support. 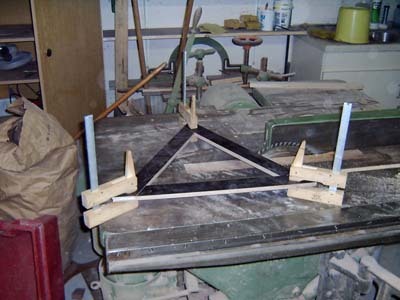 The mirror rests now on each two Teflon stripes attached to small wooden seesaws, that are mounted on the left and right sides of the lower rung. On the mirror, two small patches of Ebony Star were attached by double sided tape. The advantage of this construction is a good lateral fixation of the mirror, still allowing smooth motion along the optical axis, e.g. during collimation. 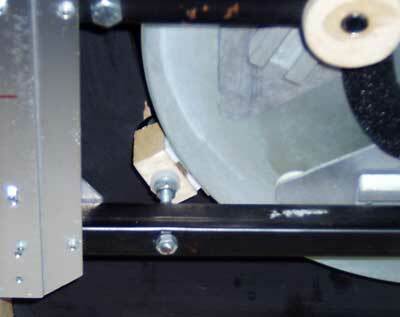 For more about the pros and cons of different lateral supports see the web page of Jan van Gastel. 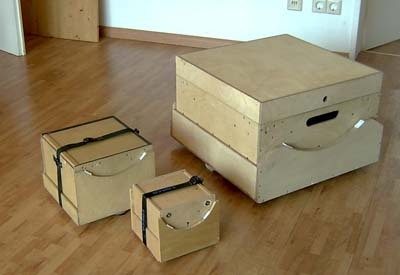 The mirror box is made of 9 mm plywood with additional reinforcements at the bottom and at the top corners below the split blocks. 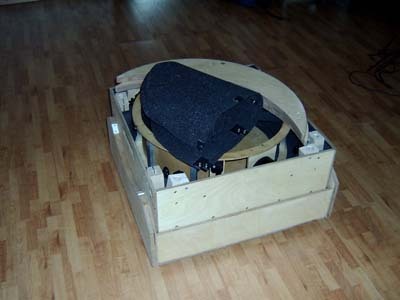 The box measures 50 cm x 50 cm, which is a bit to large for a 35 cm mirror, yet allows to accommodate the secondary cage during transport. 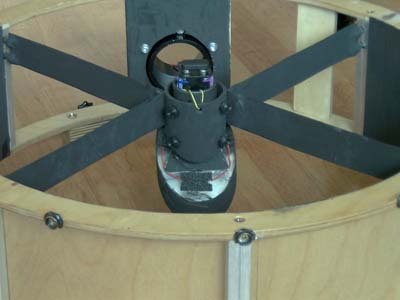 They are made of 21 mm plywood and have 60 cm diameter. 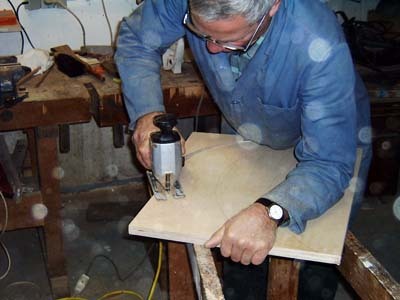 My father, a retired furniture maker, cut them out smoothly. They were laminated with Ebony Star and are attached by two M5 hand knobs. 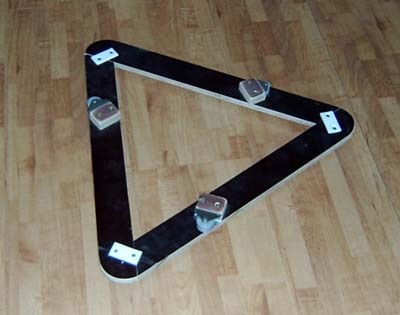 The ground board is made of 12 mm weatherproof plywood as a triangle. 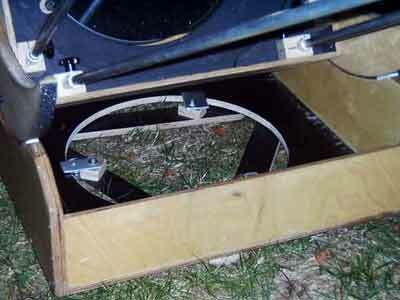 The bearings are Teflon on Ebony Star, the rocker box is held in place by three little furniture wheels. 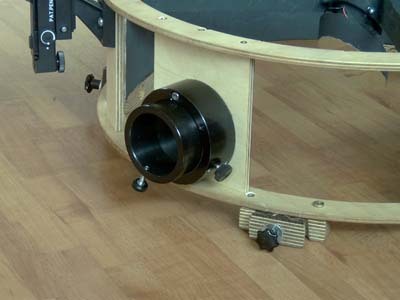 The rocker box consists of 18 mm sides and a 12 mm bottom. 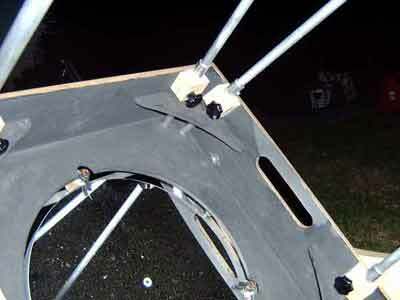 As I said, the secondary cage and the altitude bearings fit into the mirror box, which can be closed by a lid. 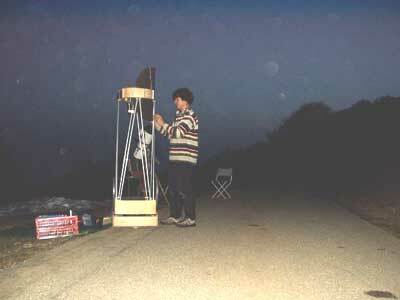 The telescope can be put into the car and all other things you might need can be placed around and on top of it. And this may be a lot if you leave for holydays, go with the kids to the grand parents, or leave for the alps for observing. And that's the whole "family", the (at that time) big one with 14 inch, the 8 inch travel Dob, and the little one, a 4 inch Dob to play with.